Unlike last year in Scotland, the drying rooms were hardly required this time! This, the Eighth English Raid, was its second visit to Plymouth. Crews were looking forward to exploring some areas which had been inaccessible in 2015 due to unusual wind conditions. A few en-route mishaps amongst the 19 entries re-shaped the final line-up which none the less included an interesting range of "Sail and Oar" craft, with a few boatless sailors crewing for other skippers. The list is here. Most participants enjoyed the comforts of a bed in the Mount Batten Watersports Centre; some brought their wheeled accommodation, and the bravest sailors slept afloat! Monday 14th August - Afternoon arrival. Launching. Dinner at The Centre. Morning - The splendid weather and beneficial tides prompted a visit to Cawsand & Kingsand. A course was set southerly from the Mount Batten mole, beyond the breakwater, around "E Tinker", and then westerly, keeping south of Knapp, to Cawsand. Molly made a near perfect (lucky?) 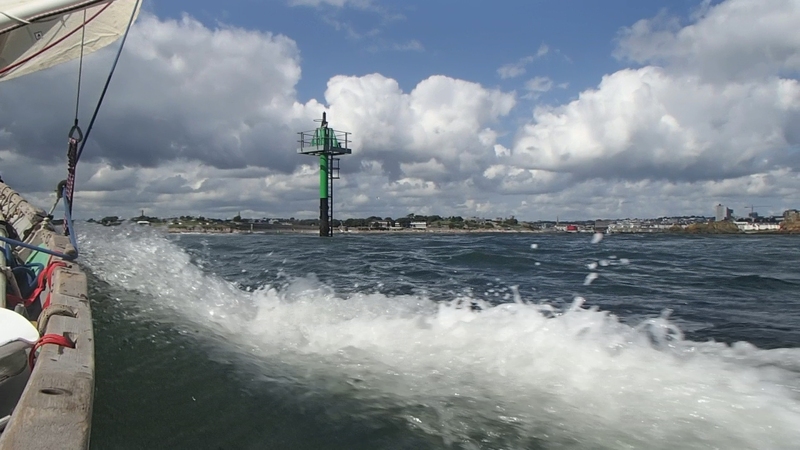 pick up of a buoy. The fleet anchored or moored to buoys off Cawsand beach and crews were ferried ashore by RIB. Lunch - "Mollies" enjoyed their packed lunch on the beach and in The Square, then sought re-hydration at hostelries. 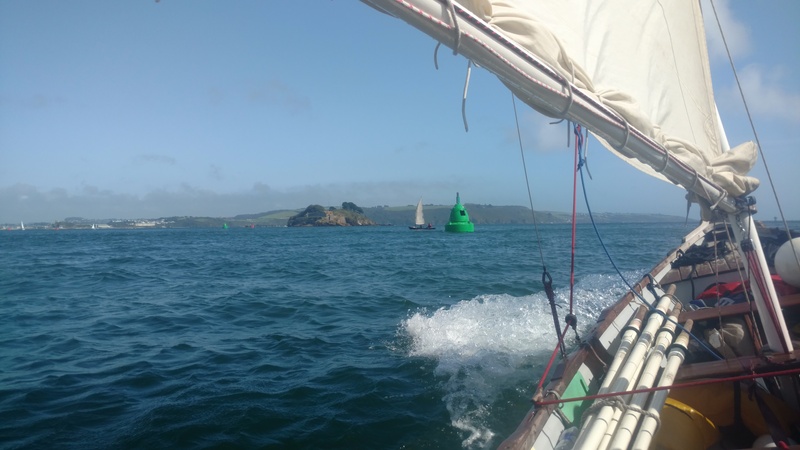 Afternoon - A course from Cawsand around "New Ground", through The Bridge, around the Drake's Island buoys, and "home". The Mountbatten pontoon seemed difficult to approach under sail. Statistics & Tracks - Click here. Evening - By ferry to Sutton Channel pier, then on foot to dinner at Royal Plymouth Corinthian Yacht Club. 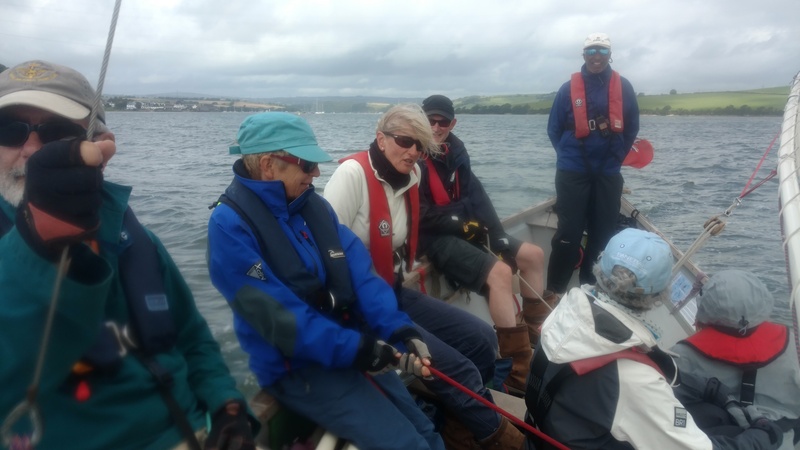 The wind and legal issues around the use of the RIB, determined that we should go inland, so the destination was to be Saint Germans, with an optional lunch/toilet stop at Saltash Sailing Club. Saint Germans is accessible only at high tide, so there was no point in rushing. Molly was able to progress to within a few feet of the quay without grounding. The decision to turn to starboard put Molly on the mud of the lee shore, the wind pushing her further on. A few minutes with oars saved the day. Molly made swift progress back down the Lynher River to Saltash where the direction of increasing wind, and the apparently narrow channel, made the approach to the club pontoon very challenging under sail, but a mooring was achieved on the stone pier, and a club member provided helpful advice about depth. 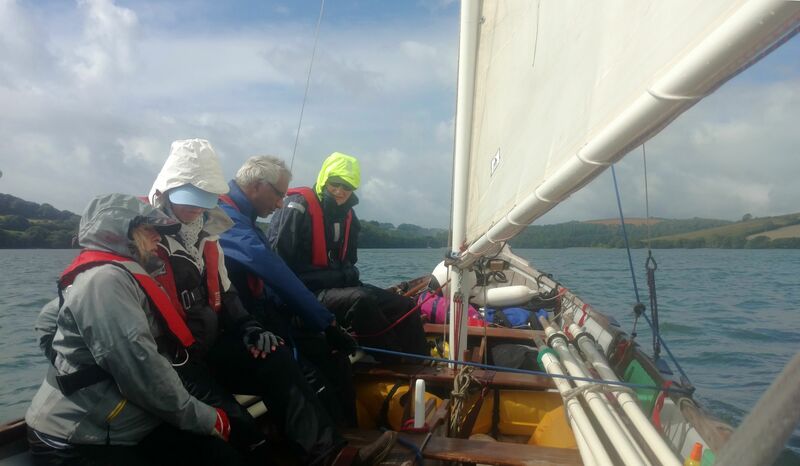 Lunch - Saltash Sailing Club welcomed the handful of fleet crews. They enjoyed getting out of the wind for about an hour before setting sail again. Afternoon - A lot of tacking was required to make way south past the Naval docks (where the patrol boat shadowed Molly to ensure she did not attack the submarines), and the chain ferries. A strange calm descended in the lee of Cremyll. Number-one oars came out to ensure safe clearance past the pillar whilst being flushed out seawards. A good following wind soon picked up, and Molly raced home. Evening - The rain had held off all day, but came on with a vengeance just as the party set out on foot to Clovelley Bay Inn. Sailors got wetter walking to dinner that they had "at sea" all day! Morning - The sun shone again but strong wind encouraged reefing again. The plan was to go as far up the Tamar as time and tide would allow, whilst ensuring enough time was left to return home to catch the ferry to dinner. 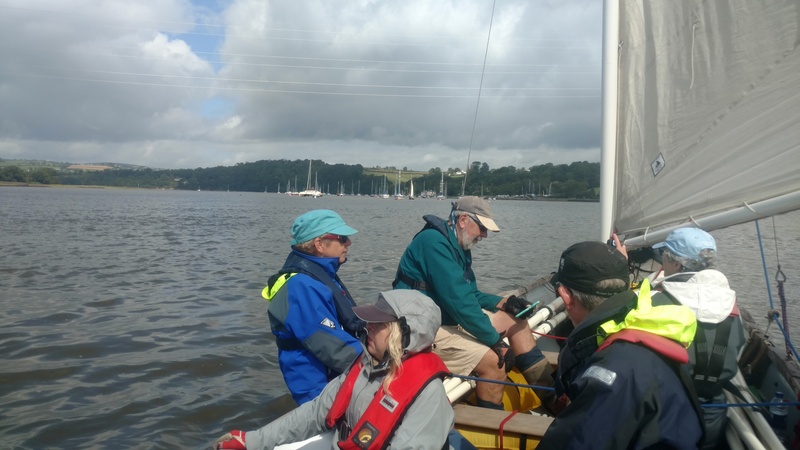 Molly crew enjoyed another good cruise past the Naval docks and made good time up to Weir Quay before returning to Saltash Sailing Club. Lunch - Saltash Sailing Club - This time, a brisk approach was made across the wind, through a gap found in the trots, and straight onto the pontoon. Pity there was nobody there to applaud! The Club again provided welcome relief from the wind, but the bar was unfortunately closed! 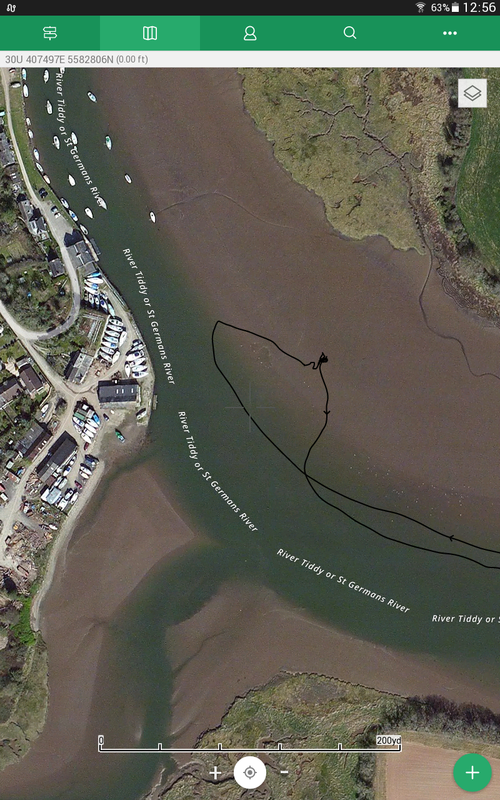 Afternoon - A self-timed race was set from off Saltash SC, remaining within the channel buoys downriver and "home". Molly made a text-book departure, sailing off the pontoon, and was soon tacking down river. The chain ferries necessitated an annoying dog-leg, but other than that, the passage was easy. 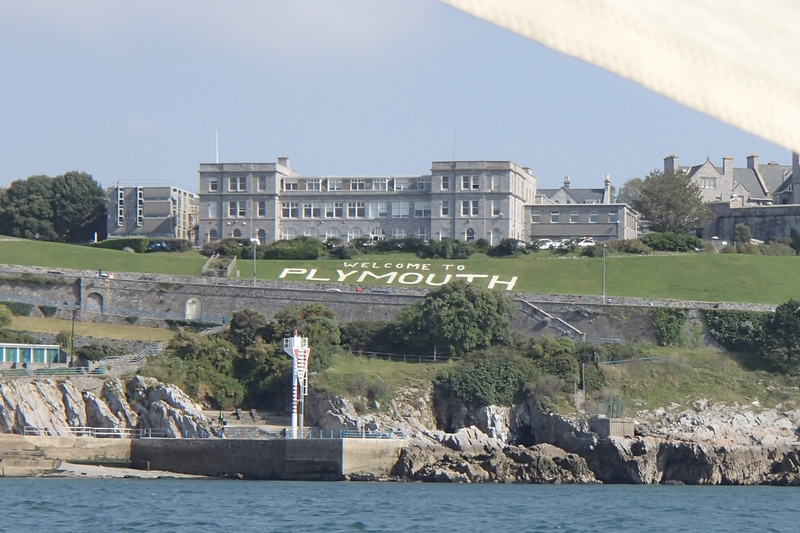 The following wind drove Molly at high speed past Plymouth Hoe and up to Mountbatten. The approach to the pontoon was more successful this time. Thursday 17th - Evening - Final Dinner at the Royal Western Yacht Club (the best of the Raid?) was rounded off with accolades and thank-yous. Opposite - View of Mount Batten from The Royal Western YC. (1) Approaching moorings under sail - Maybe some "post-mortem" and practice required? Whatever the wind direction, shouldn't there always be a way to sail onto a mooring? (unless it is particularly congested). A "sail-past" in each direction should aid the decisions about how the existing wind and tide conditions influence (a) the sail configuration to use, (b) the best route to the landing. It will also give time for the crew to briefed and for lines, fenders, etc. to be prepared. An approach which grants power when it is needed, and the ability to de-power when required should enable an un-spectacurar arrival. 45 to 80 degrees off the wind will enable this. You cant "dump" the wind if the mainsail is against the shrouds, so in a following wind (90 or more degrees off the wind) go in under gib alone, or even "bare poles"? (2) Narrow Channels - If the channel is uncertain or narrow, is it better to go aground on the windward (upwind) side, or the leeward (downwind) side? 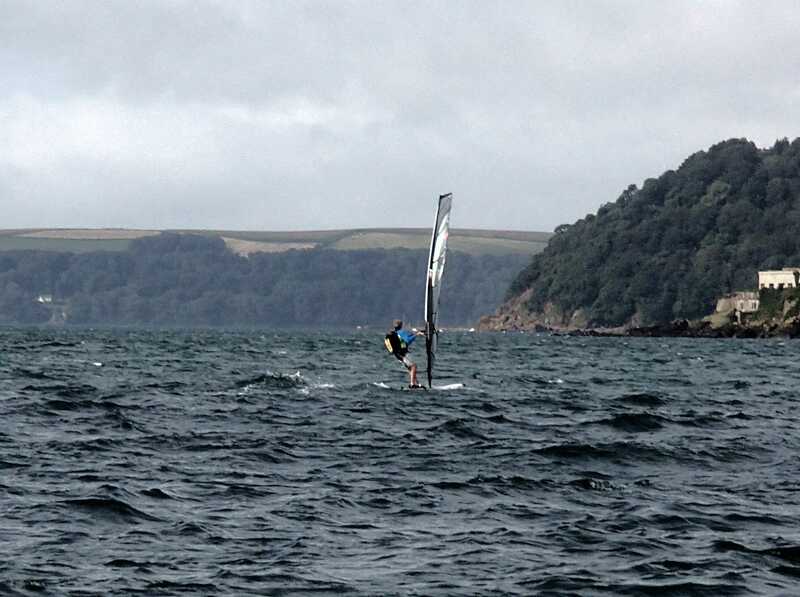 Answer - Getting off a lee shore (downwind side) is difficult because you are continually blown on to it. The windward (upwind) side is the better risk because you tend to be blown off it. Wind was from SW. The temptation to gybe to Starboard into the seemingly wide water is understandable - The lack of depth is not necessarily visually obvious from the helm, though the curve of the river is a strong clue to where the shallow water is! Where in 2018? - Watch English Raid website - Suggestions welcome. Got any Contributions? Text or pics? Previous English Raids - 2016, 2015, 2014, 2013, 2012, 2011, 2010 (password Molly) & here. Tuesday 15th Sept, am. MBC > Cawsand. Tuesday 15th Sept, pm. Cawsand > MBC. 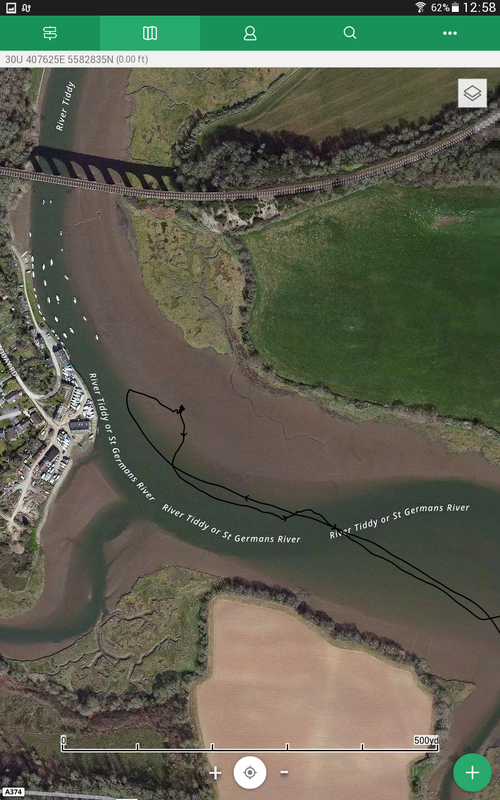 Wednesday 16th Sept. MBC, St Germans, MBC. Thursday 17th Sept MBC, Weir Quay, MBC. See time, distance, speed at any point on a track. Why are tack angles so variable? HOW TO USE "VIEW RANGER" - Conversion. 1 Statute mile = 0.87 Nautical miles approx.